Live Skype chats played an invaluable role in the disaster response to Haiti but this has gone largely unnoticed by both mainstream and citizen media. I have a Word document with over 2,000 pages worth of Skype chat messages exchanged in various groups during the first 2.5 weeks after the earthquake. I have no doubt that this data will become a source of major interest for scholars seeking to evaluate the disaster response in Haiti. For the full story behind the above exchange between Anna, Eric and myself, please see my previous blog post. In addition to SAR staff, the US State Department, a White House liaison contact, SOUTHCOM, DAI, UN/OCHA, WFP, the US Coast Guard, a Telecom company, and so on were all on live Skype chats at one point or another. 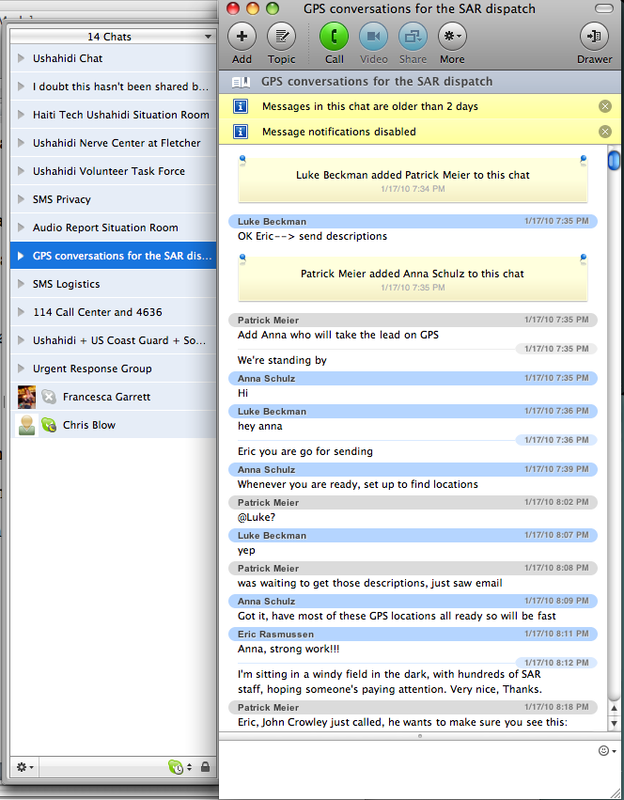 It’s actually hard to keep track of everyone who has used the various Skype chats since the earthquake. I started the Haiti Tech Ushahidi Situation Room a couple hours after David Kobia and I launched the Ushahidi-Haiti platform. The second person I called (on my cell) after David was Chris Blow from Meedan. Chris got started on the icons for the platform right away. In the meantime, we used color-coded dots to represent the different categories/indicators. [1/12/10 9:09:55 PM] Patrick Meier: hey Chris, you there? 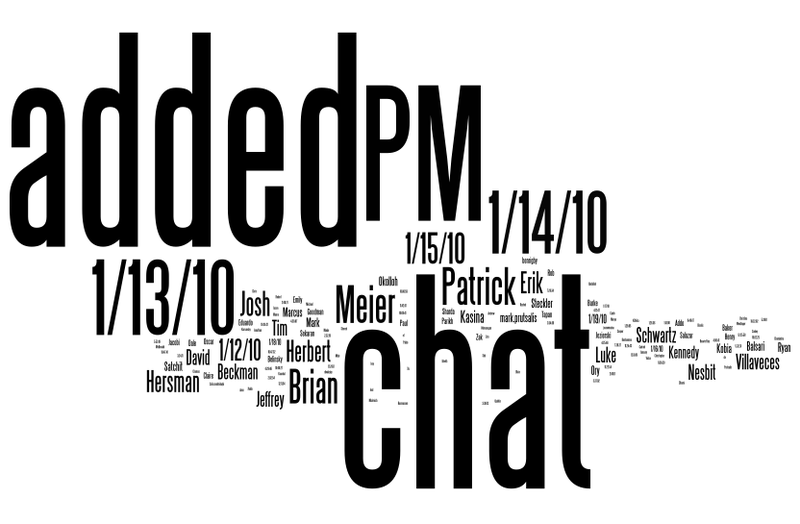 Below is the Wordl visualization of all the data in the Haiti Chat group, i.e., not only users being added but also the full content of all the chats between 9pm on January 12th through 9pm on January 30th. This constitutes over 300 pages of content in a Word document. Of course, dates and individual names still come up most frequently. 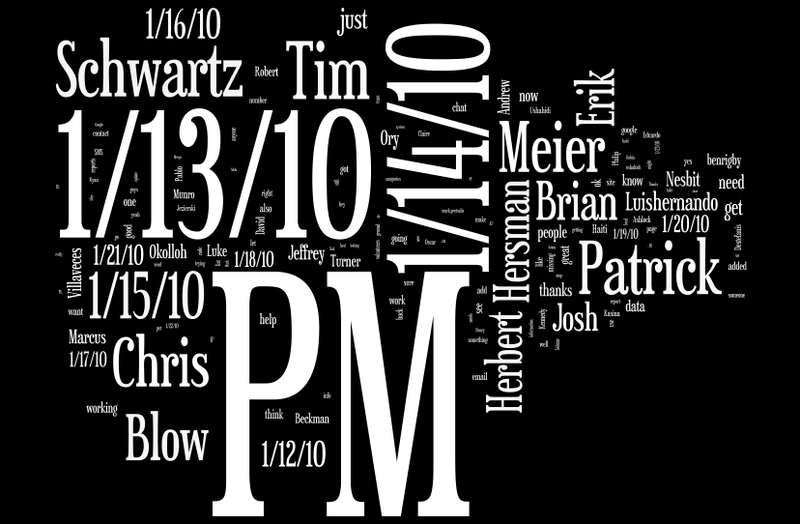 The Wordl visualization below draws on the first week of data but with all names, dates and times removed. This enables us to focus exclusively on the content or dialogue exchanged between users. I like the fact that the word “thanks” stands out fairly prominently. Stay tuned for more Wordl visualizations on the other Skype chat groups. In the meantime, if you want to get started on some more statistical discourse analysis or social network analysis, please feel free to get in touch. Thanks! This entry was posted in Crisis Mapping, Humanitarian Technologies and tagged Haiti, Skype. Bookmark the permalink. Really fascinating stuff – thanks for sharing. I’d definitely be keen to hear whether (in particular) you have any comments about the Mac group IM UI. I’m glad you pointed out the fact that “thanks” came up a lot. Being connected in real time to everyone involved enabled us to knock out requests rapidly. 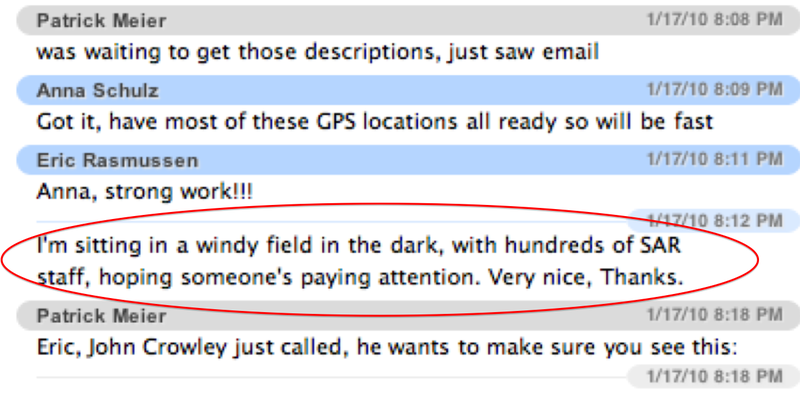 Saying thanks in the chat room is almost like closing a ticket. It speaks volumes to the amount of work that was and still is getting done because of having the chat rooms available. Thanks Brian, and very good point re “closing a ticket”; a good proxy indeed for the volume of work that the chat rooms have and continue to facilitate. evidentally i talk a lot. I’m actually using the dialogue Wordl as my desktop wallpaper now. That is a great idea! I’m about to train some Geneva volunteers and will make this my desktop image too! Sends a great image. Thanks Patrick for the observations- would love to see this analyzed also! Hi Patrick, Interested read. As a social scientist i have completed research regarding media reports related to missing and/or murdered aboriginal woman and coded for key words, refined and then analyzed results. Give me an idea of what you wish to highlight and time frame, and perhaps i may be able to help? Have a few morsel on my plate at the moment but will look at data and key illustrative points to document the overall effort, if you wish. Of course their may be others who could do it a little quicker then me right now.. I find this information fascinating. I also find it interesting that “thanks” was distinguished in the visualizations. 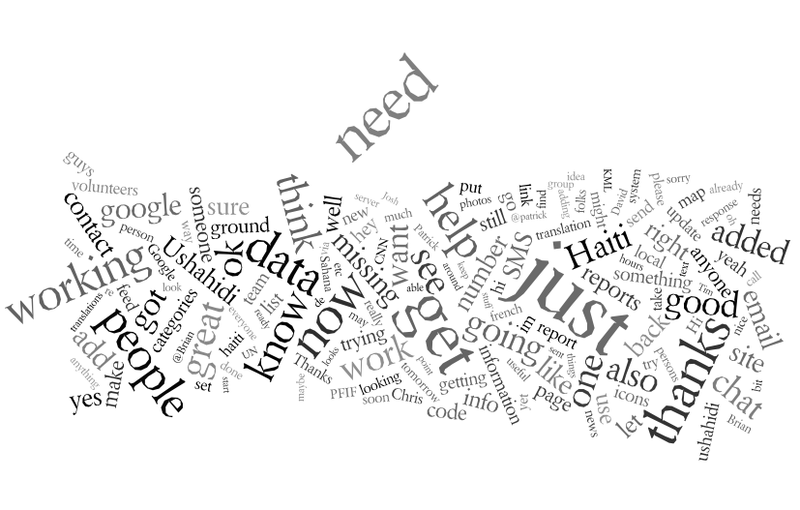 The Wordl visualizations really gave me a quick look into the live chats and I appreciate you sharing them. Great insights! Thanks for sharing this information.